How do we create so many successful ad campaigns? How do we negotiate the best media buys? We're fortunate to have assembled an amazing award-winning team.Steve Garland started as the son off a plumber, and today is a veteran Radio/TV Broadcaster and award winning Strategic Marketing guru. He's produced three decades of award winning radio commercials, TV commercials, Digital marketing and consumer entertainment, for clients as large as APPLE and ABC-TV, to regional clients in many industries. But Steve and his team are best known for their work in HVAC Advertising, Plumbing Advertising, and other home improvement industries like Pest Control. After doing this for 30 years you learn a few things. We're achieving success in digital marketing today not only by our ability to provide cost efficient radio & TV advertising anywhere in the country, but also in our increasing experience and capacity, using dedicated software and skilled personnel, to provide top quality HVAC advertising as well as Plumbing advertising, Pest Control advertising, and other industries with great success. We do things differently, and we're dedicated to taking care of our clients year round. It's all your marketing, simplified. This is our story, and a snapshot of our team members. We started during the glory days of radio, then moved into TV, then digital. As we grew we added a production company, a jingle company, an SEM digital department, and support staff. The mediums change, but having a great idea, and a great pitch-never does. After three decades of successful ad campaigns we're proud to say we are a PREMIERE provider of advertising, media and marketing solutions. We can find a unique story about your company, and tell it in a way that's engaging and entertaining. We've won our share of awards doing just that. More importantly, we know how to SELL your story. 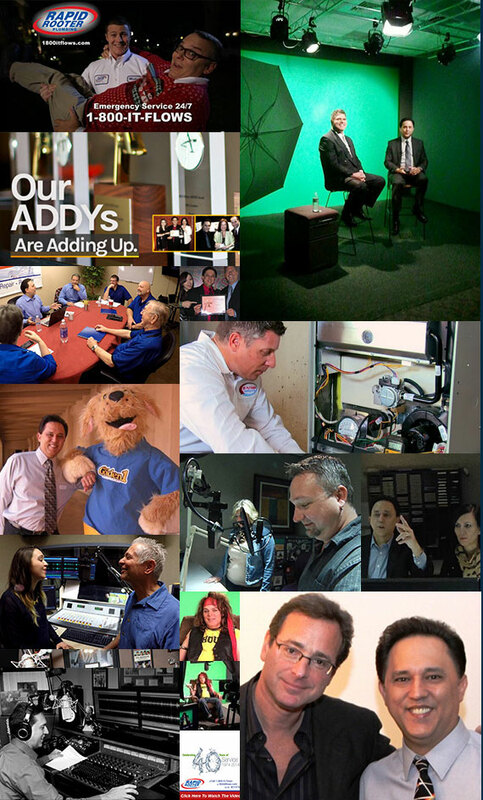 Especially to a large audience across radio, TV, digital, pay per click, social media, even outdoor and direct mail. We do serve many industries, as highlighted on our home page- but starting in the plumbing business gave me a special knack for understanding how to build a successful Ad campaign for clients in the home improvement industry - like plumbing and HVAC. We can help you formulate a strategy to maximize the effectiveness of your marketing budget, finding the right places and the right times to share your message with right audience. And after all these years, we're pretty well connected to all the major broadcasting companies. We can leverage our connections in the industry to get you the best possible buy rates. But the real difference with us is that we're still all about creating great ideas for our clients. Some clients call us "wizards", some probably think we're just little crazy. Even so, they all keep re-signing every year! Ask them yourself- maybe they'll have a great story to tell you about us. The real secret to our success is simple. What we do....works! President, Strategic Planning & Creative Dir. They chose this photo of models to represent their awesomeness! "Steve is an exceptional asset to his clients. He combines a serious commitment to building their business, with the marketing savvy to produce powerful campaigns. The effectiveness of his efforts are evident in the number of business owners who look to Steve as a partner in their success. I highly recommend him." Here are some of our good friends. Pay them a visit.